The Czech Agroforestry Association, in cooperation with other organizations, has held a series of seminars and conferences related to Agroforestry. Now, partner institutions and platforms are organizing a follow-up conference at which new experience, best practices and results of recent scientific research. EURAF’s vice-president João Palma and Pablo Silva attended the Civil Dialog Meeting on Rural Development, in Brussels, on the 27th February 2019. Over a thousand fresh scientific insights will be presented by hundreds of speakers. Events throughout the city will bring agroforestry closer to everyday life. Field trips to surrounding agroforestry farms, tastings of agroforestry products, a gala dinner and dozens of side events will make for a busy week indeed. Keynote addresses were given by Jerzy Plewa (DIrector General for Agriculture, Maurio Petriccione DG for Climate and Daniel Calleja-Crespo DG for Environment). It was gratifying that all three mentioned the potential importance of agroforestry. The Forum holds annual meetings at which there are presentations to describe the latest research, development and practice related to agroforestry and farming with trees. The first call for abstract will be launched by July 2019 on a website dedicated to EURAF Conference 2020 (soon available online) with further details on the conference. The audience composed by about 80 persons from academic and non-academic institutions established a starting point for new global collaboration between Europe and Eastern Africa aiming at facilitating the adoption of sustainable agricultural practices through sharing the knowledge about agroecological principal, integrated crop-livestock and agroforestry systems of smallholder farmers in marginal areas. Are trees not an obstacle for working on agricultural fields? Some questions like this were discussed during the interactive agroforestry workshop held on the 10th of January at Agriflanders, a well-known agricultural fair in Ghent, Belgium. The position has a start date of August 2019 and application deadline of 10th April. Farmers are financially supported in setting up an agroforestry system. The focus is on wild fruit trees and trees for high value timber that have rarely been planted so far. Around 700 amendments have been proposed for the current ESF+ proposal. A key aspect of this financial instrument is its increasing budget to 120.5 billion €. Another change of potential interest for agroforestry is the increase of the territorial cooperation (INTERREG) goal to 3% of total funding. The last of the project outputs will be the creation of short educational videos on the possibilities of agroforestry implementation at existing farms and the benefits of using it. Videos will be freely available on the internet. The award winning BBC2 programme "This Farming Life" captured the first full year os Lynbreck Croft as a new agroforestry farm. The event was a big success and can be seen a milestone for agroforestry development in the country. SMART project was dedicated to agroforestry systems associating fruit trees and vegetables. It has produced some papers, leaflets, a design handbook for new comers, and also several videos showing most of the farms involved in such alternative and low-input systems. Depasse' project, deals with silvopasture systems, with ongoing trials involving hence/sheeps in olive/apple orchards to assess their services on crop quality; 'SAM' project deals with alley cropping, for arable crops, but also vegetable growing as the most considered system. In 2018, the prize was awarded to Yacouba Sawadogo, from Burkina Faso, and Tony Rinaudo, from Australia, for turning large parts of the Sahel region into productive land. Late November and December around 700 people got together in the two events. The National Plan aims at stimulating the adoption of Agroforestry practices in France. Agroforestry can save the world, COP told! Did you know that your favourite agroforestry federation took a star turn at the climate COP in Katowice, Poland? As EURAF President, Patrick organised an event together with GEF, the global environmental facility; CDLS, the Caux dialogue on land and security; and the World Agroforestry Centre to discuss a vexed issue: why are high-level decision-makers, whether active in the public or the private sector, so ignorant of basic ecosystemic processes, and what can we do about it? 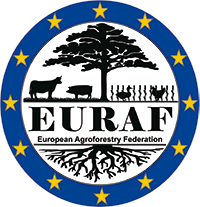 A presentation was given by EURAF,giving initial draft ideas for an “Ecoscheme” to enhance tree-based landscape features, and agroforestry in all Member States. These ideas are being developed by the EURAF Executive Committee for wider consultation with members.